Campania may be best known for its splendid Amalfi Coast resorts, archaeological sites like Pompeii and Herculaneum, and scrumptious rustic cooking, but it is also home to two of the most magnificent residences in Europe, the Royal Palace of Naples and the Royal Palace of Caserta. Naples was an independent kingdom from the 13th through 19th centuries (known as the Kingdom of Sicily for most of its existence and from 1816, the Kingdom of Two Sicilies), its rule shifting between France, Austria, and Spain. 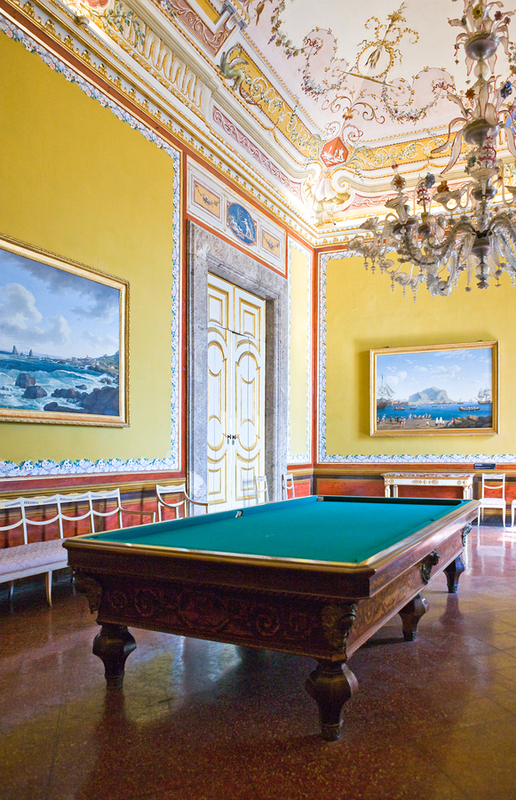 The Spanish were responsible for the construction of the kingdom’s most lavish palaces. 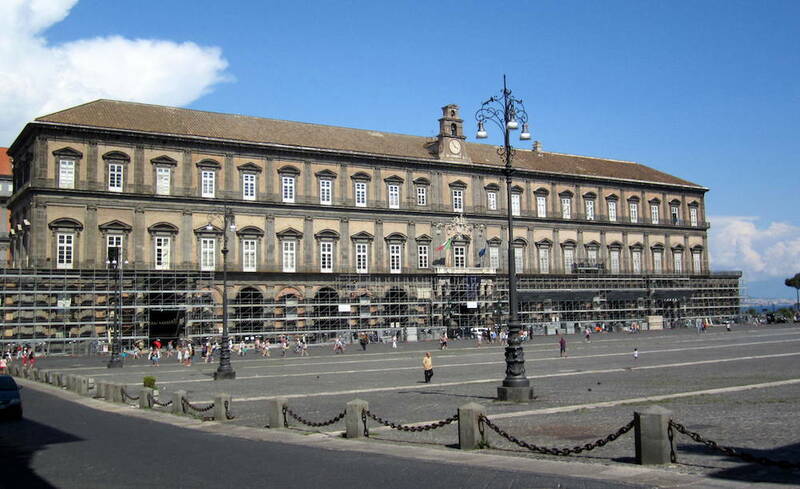 The Palazzo Reale in the heart of Naples was originally designed as a retreat for King Phillip III of Spain; in 1734 it became the royal residence of the Charles III. Another Bourbon king Charles VII, spearheaded the building of Caserta, enlisting the starchitect of the day, Luigi Vanvitelli, to create an edifice that rivaled Versailles. 1. The Royal Palace of Caserta (Reggia di Caserta) is one of the largest royal residences in the world. Modeled after Versailles and designed to provide a secure inland bolthole for the Neapolitan royal family, the palace has 1200 rooms (Buckingham Palace “only” 775) spread out over five floors. Charles VII authorized its construction which began in 1752, and as with many palaces, it took centuries to complete. The sprawling complex was designed to house not only the king and his family, but also the Neapolitan court and government. 2. For the Napoleon Bonaparte connection: Napoleon’s youngest sister, the ambitious Caroline Bonaparte Murat, was Queen of Naples from 1808 to 1815. When her husband, a charismatic French military leader, Joachim Murat, was given the title of King of Naples, Caroline, thanks to her formidable brother, became not only queen consort, but also ruler in Murat’s absence. 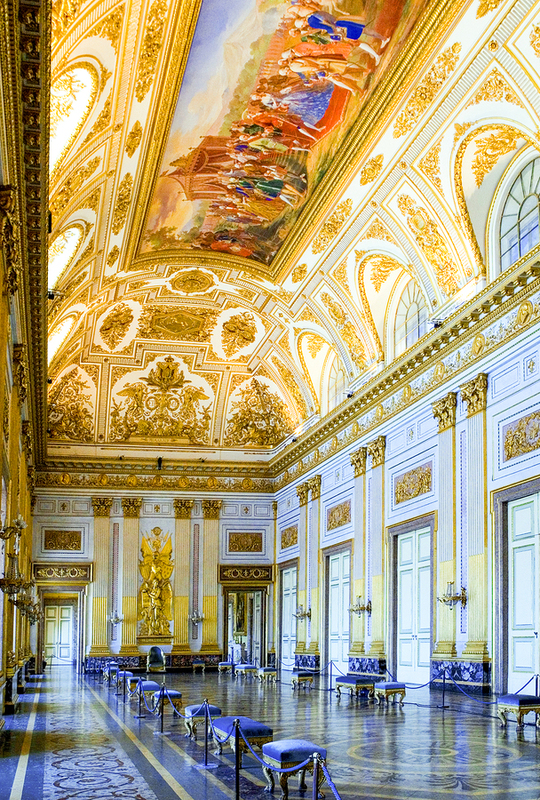 The royal couple decorated many of the rooms in the Royal Palace of Naples (Palazzo Reale) in neoclassical style, importing pieces from the Elysee Palace, which Murat had purchased when he was governor of Paris. 3. For the Marie Antoinette connection: Marie Antoinette’s sister, Maria Carolina, was a powerful queen in Naples, reigning from 1768-1806. When her mother, the Hapsburg Empress Maria Theresa, negotiated with the Bourbons to place her daughter on the Neapolitan throne, a stipulation was that Maria Carolina would be more than a figurehead—that after producing an heir she would have a role in the affairs of state (to better further Hapsburg interests). With her husband, Ferdinand IV, often more interested in leisure pursuits than governing, Maria Carolina ruled Naples and became a significant arts patron.The Palazzo Reale’s lavish theater, Teatrino di Corte, was built for her wedding to Ferdinand. Portraits of the royal couple are on display in the Throne Room. 4. For an historical overview of major decorative arts trends. 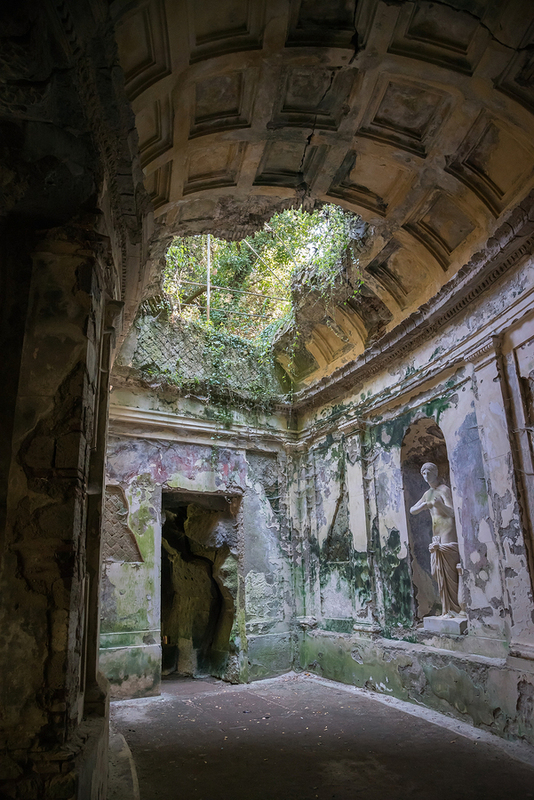 There are two royal apartments at Caserta offering splendid examples of 18th- and 19th-century decorative pieces and furniture. The older 18th-century apartments showcase the exuberant rococo and rocaille styles, the latter on view in Queen Maria Carolina’s rooms. In the 19th century apartments you’ll see examples of how tastes changed to the more subdued neoclassic and empire styles. 5. To see the power of Neapolitan queens in glorious display. The historic royal apartments pay homage to the clout of queen consorts who often ran the Neapolitan kingdom and shaped its cultural life. The rooms devoted to these women are as grand and often grander than those utilized by their husbands. In the Palazzo Reale you’ll find their private apartments and reception rooms which were decorated to the max with ornate gilded stucco work (the queen’s private suite);17th century paintings dating from the palace’s earliest years (the queen’s first parlor); rococo-style ceilings and neo-baroque furniture (the queen’s second salotto or parlor); and fine 19th century furniture from France and England (with pieces once owned by the painter Degas’ grandfather) in Queen Amalia’s suite. Even the queenly passageways offer such treasures as allegorical 18th century frescoes celebrating marriage and mythological Roman deities. 6. 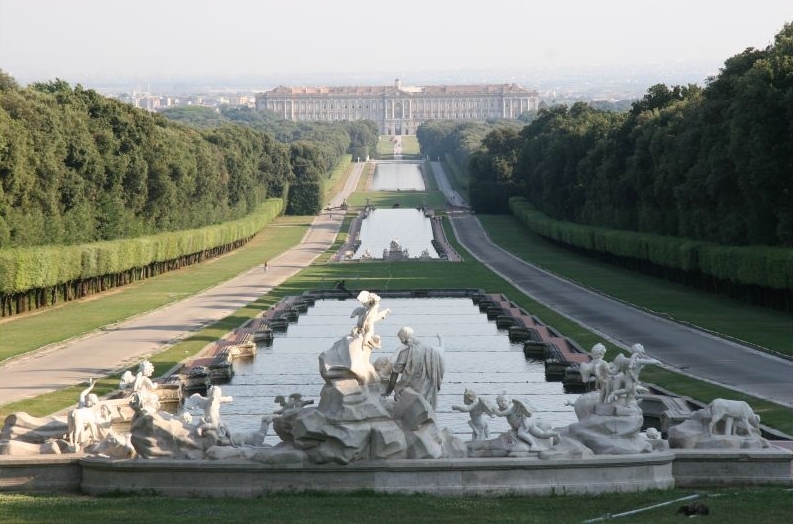 To experience the world-famous Royal Garden at Caserta. The Versailles-inspired gardens were created by the architectural master Luigi Vanvitelli, who designed them with a “telescopic effect”: when viewed from the palace, they reach all the way to the horizon, running over two miles in length. 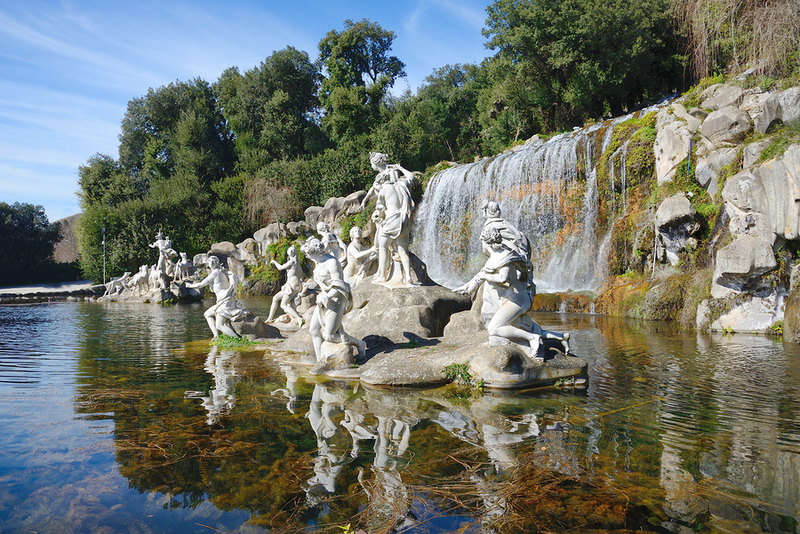 Richly appointed with temples, mythological statues, waterfalls, pools, and fountains, the main gardens were created according to formal principles of Renaissance landscape design. Queen Maria Carolina, perhaps influenced by her sister Marie Antoinette, who introduced a naturalistic English-style garden at the Petit Trianon in Versailles, created one at Caserta. You can find it near the statues of Diana and Acteon. 7. 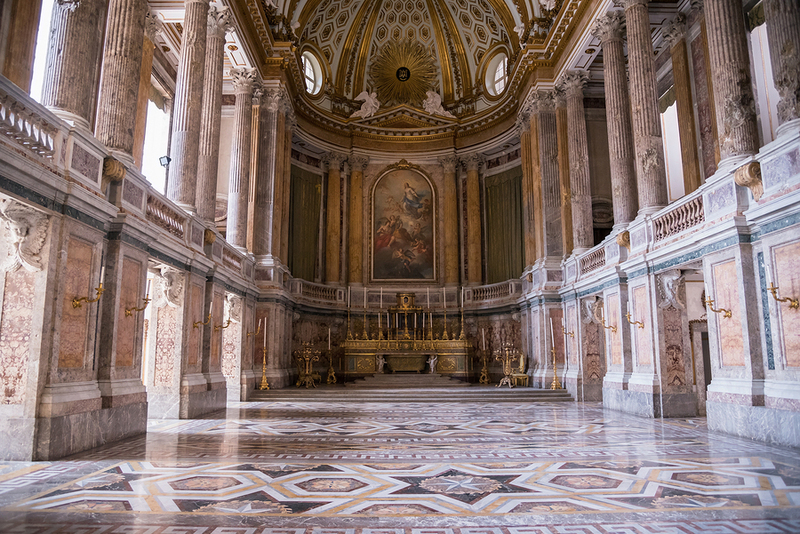 For the abundance of frescoes at the Royal Palace of Caserta. There are over 40 rooms adorned with frescoes (as compared to 22 in Versailles), representing a full range of decorative styles: baroque, rococo, neoclassic and Empire. 8. 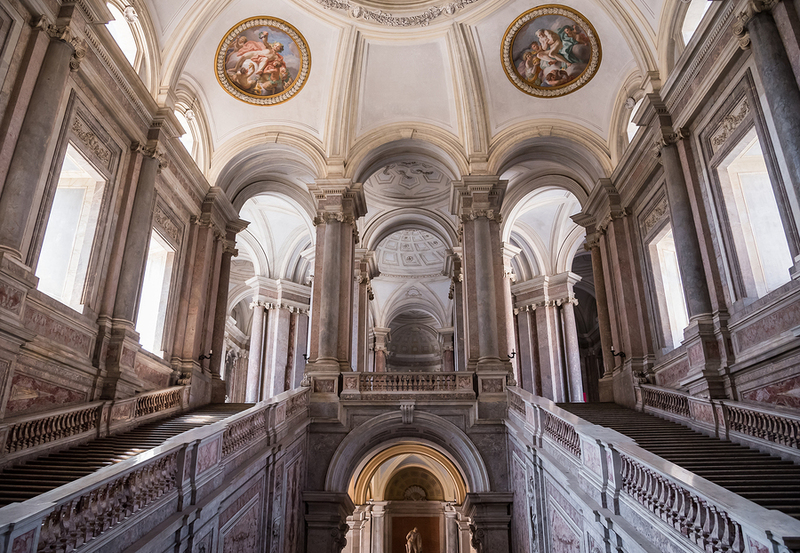 For staircases like you’ve (probably) never seen before: A hallmark of palaces built during the Baroque era, the grand staircase connecting a royal residence’s ground and first floors (the piano nobile), exhibited new levels of dramatic magnificence and often incorprorated elements of theatrical set design. At the Palazzo Reale in Naples, the Scalone d’ Onore, the marble “great staircase,” originally constructed the 1600s, was richly refurbished two hundred years later (after a palace fire) by Gaetano Genovese, a favorite of Ferdinand II, and Francesco Gavaudan, who also worked on the restoration of the famous Teatro San Carlo in Naples. Caserta’s Scalone D’ Onore was designed by the renowned Luigi Vanvitelli. Like much of his work, the multi-colored marble staircase blends baroque and classic elements, and is a directional architectural piece that influenced the staircase design of aristocratic residences throughout Europe. The Scalone is a favorite of filmmakers—look for it in Steven Spielberg’s upcoming movie,The Kidnaping of Edgardo Mortara (2018). 9. For the amazing National Library at the Palazzo Reale. It is home to a large collection of papyrus scrolls from Herculaneum, the ancient Roman site destroyed by the volcanic eruption at Mount Vesuvius in 79 AD, and remnants of a 5th-century Coptic bible. The library houses the Biblioteca Lucchesi Palli di Napoli, where you’ll find letters written by the composer Guiseppe Verdi and autographs of major 19th-century composers like Gioachino Rossini and Franz Liszt. 10. The “power” facade of the Palazzo Reale. 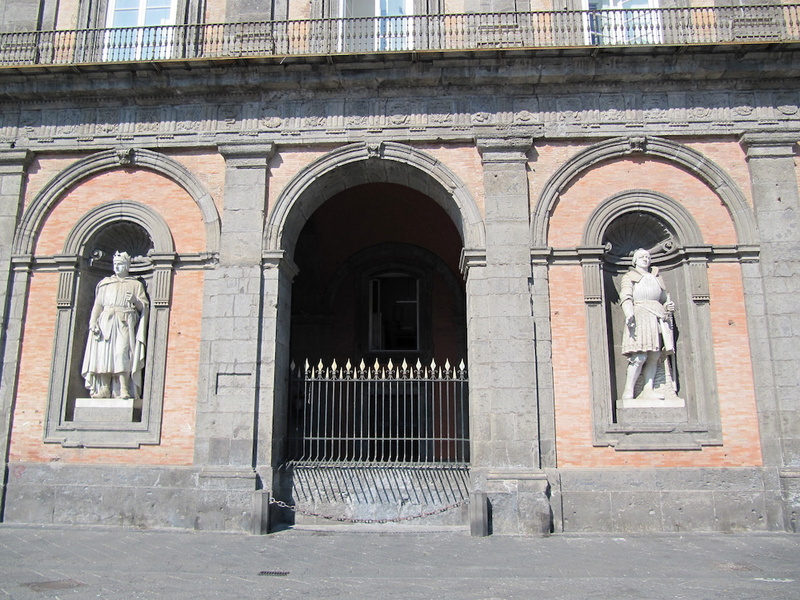 The statues adorning the palace’s exterior pay homage to eight of the men who ruled Naples from the 12th to 19th centuries, ranging from Frederick II, the Holy Roman Emperor, to Victor Emmanuel II of Savoy, and provide a concise, visual history lesson in the mutability of fame, power and kingly fortune.